Hong Kong, 26 January 2018 – At the 11th Asian Financial Forum (AFF), Cyberport organised an InnoTalks session entitled “Emerging FinTech Innovations for Asia”. 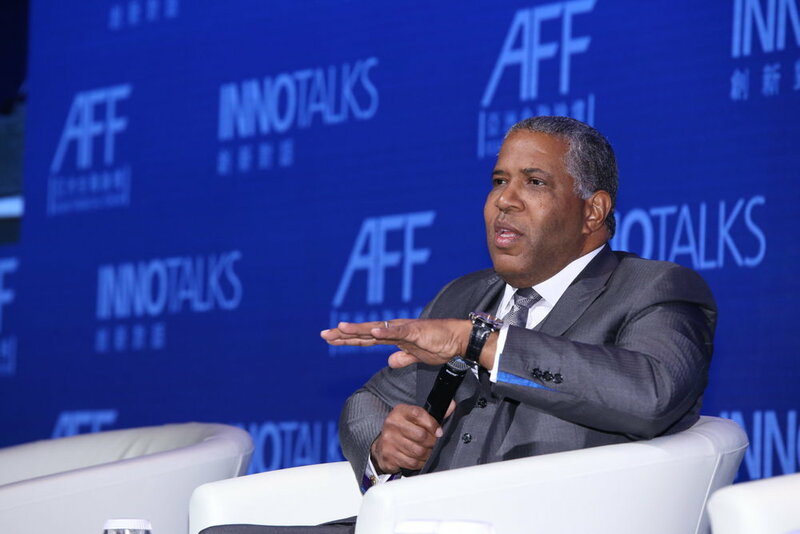 As Hong Kong’s foremost FinTech advocate and the FinTech hub of Asia, Cyberport was again the Fintech Partner of the AFF, a role it assumed for the second time. The day was both a showcase of some of Hong Kong’s outstanding FinTech start-ups to international industry and business leaders, and an occasion for top industry experts to convene and discuss FinTech’s latest developments. The InnoTalks session started with Dr Lee George Lam, Chairman of Cyberport, having a “Chairman to Chairman Chat” with Mr Robert Smith, a globally renowned technology investor and the Founder, Chairman & CEO of Vista Equity Partners. The two chairmen exchanged views on a variety of subjects, covering topics from FinTech, the digital silk road, the value of software, to Mr Smith’s success in building Vista. During the exchange, Mr. Smith highlighted the importance of FinTech in accelerating global trade. He believed that Hong Kong, with its established systems, heritage, digital infrastructure, and engagement with Mainland China, is in a unique position to create value for the digital silk road. The session was followed by a panel discussion moderated by Cyberport’s Chief Public Mission Officer, Dr Toa Charm, who spoke with four FinTech start-ups from the Cyberport community about competition and collaboration between FinTech start-ups and industry incumbents. The start- ups—BondIT, Clare.AI, TNG FinTech Group, and Seasonalife, which specialise in bond investment, AI Chatbot, payment, and InsurTech, respectively—all emphasised the importance of synergy. They highlighted their complementary roles to existing financial institutions, and discussed the challenges that start-ups face when collaborating with financial institutions, and the improvements that they would like to see. Also held yesterday was the AFF Deal Flow Matchmaking Session, which featured four other FinTech start-ups from the Cyberport community presenting their projects to potential investors. Four FinTech start-ups presented their projects at the AFF Deal Flow Matchmaking Session, including CoverGo (InsurTech), Galileo Platforms (InsurTech), Red Pulse (market intelligence platform) and Velotrade (online marketplace). FinTech-themed activities continued on 17 January. An experience day was organised at Cyberport to showcase the diverse and strong FinTech community of 250+ FinTech companies. 30 start-ups presented their innovative FinTech solutions to AFF participants and those interested in financial innovation. Cyberport is an innovative digital community with over 1,000 technology companies. It is managed by Hong Kong Cyberport Management Company Limited, which is wholly owned by the Hong Kong SAR Government. With the vision to become a main force in developing the digital tech industry as a key economic driver of Hong Kong, Cyberport is committed to nurturing youth, start-ups and entrepreneurs to grow in the digital industry by connecting them to strategic partners and investors, driving collaboration with local and international business partners to create new opportunities, and accelerating digital adoption amongst corporates and SMEs. Cyberport focuses on building key clusters of digital technology, namely FinTech, eCommerce, IoT/Wearables and Big Data/AI to foster the development of Hong Kong into a “Smart City”; amongst which, the FinTech cluster has grown into a strong community of over 250 companies. With a committed team of professionals providing all rounded value added services to support our digital community and an array of state-of-the-art tech facilities, Cyberport is the flagship for Hong Kong’s digital tech industry.